In the lead up to Rhodia’s geotextile laying mad cap idea, the company decided to undertake a public exhibition. This was attended by their consultants ERM. At the time we commented on this blog that there were still many unanswered questions concerning what would happen with the “environmental improvements” as they were touted, and why the smaller lagoon was not to be covered in the same manner. 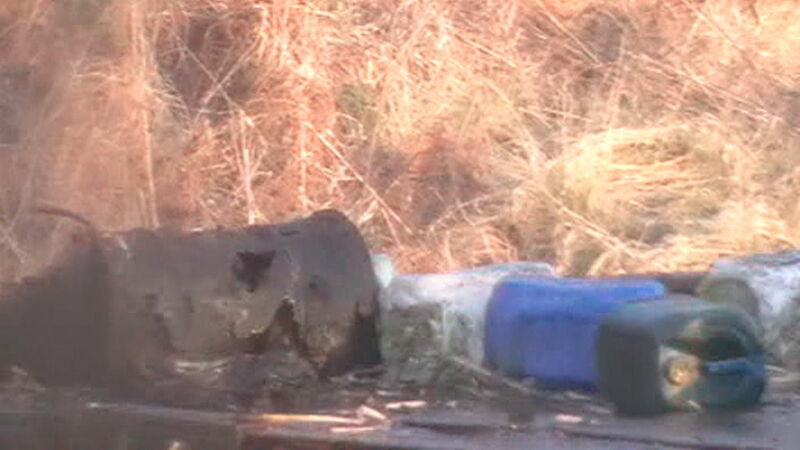 We expressed concern at the sediment being disturbed, especially around the waste pipe area. We also along with the RSPCA were willing to remove the wildfowl on the lake to prevent them being poisoned during the sediment disturbance. Rhodia now being touted as “Solvay” were not interested in our concerns. Theirs remained a PR driven exercise, as evidenced in a closed meeting from which we obtained minutes in a freedom of information request. These minutes can be read below. It is clear that they wanted to try to stage manage any concerns surrounding potential release of material to the public during the works. A newsletter was distributed to local residents putting their side of the story but mentioned nothing of the closure plan for the site– which was a legal requirement on the part of this company and would have to have been undertaken anyway. 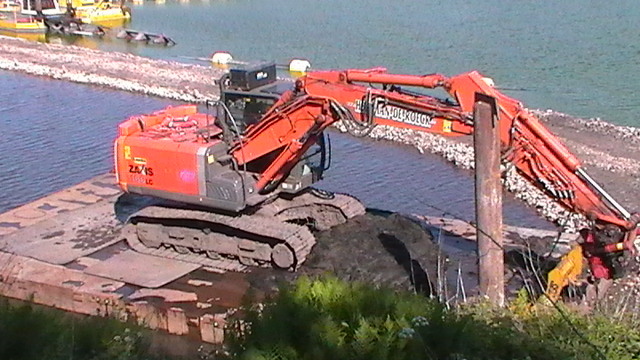 Anchoring the geotextile around the new edges of the main lagoon. We will look at each of these in turn and what we actually observed in a month by month summary. 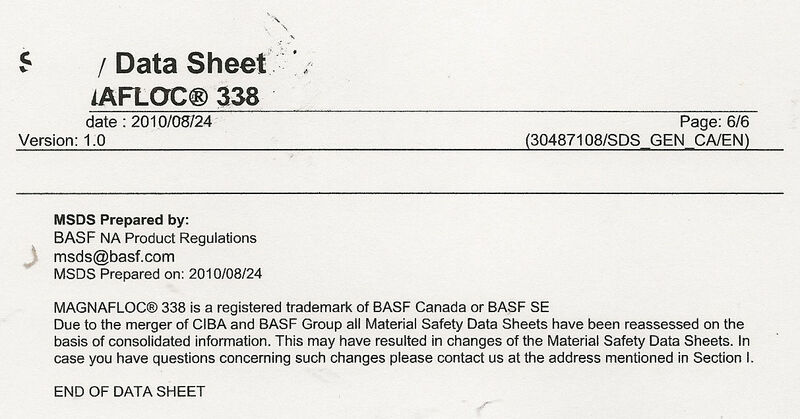 We obtained the following document in a freedom of information request. “ERM IMPROVEMENT WORKS” DRAFT JULY 2012. 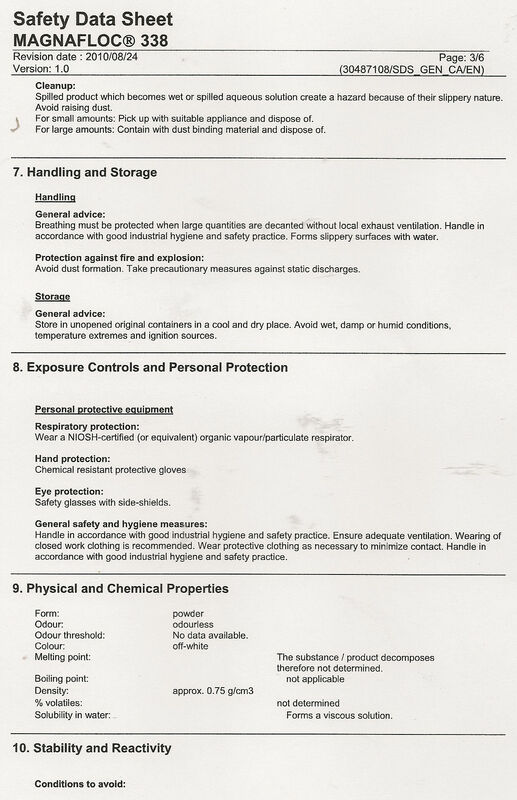 It was clear that this document had been tailored to suit Rhodia’s legal requirement closure plan for the site, and were not specifically related to reducing bird mortality from being poisoned by white phosphorus at the site, which this company have never really accepted or apologised for. Although they mention that the geotextile barrier and capping layer below the water level is thought to be “unique in the UK”, they do not go into detail as to why this should be. If the waste had been “neutralised” then why would they have had to do this? Again no mention of what they are referring to here, just a roundabout throwaway comment referring to the acute proven poisoning risk that is posed by white phosphorus stored beneath the water. The consultants like Albright and Wilson and Rhodia try to deflect the presence of p4 and the acute risk to wildfowl with another description designed to try to minimise the clear and present danger to wildfowl that this company for so long tried to pretend was no risk at all. The selection of remedial technique was driven purely by cost and the idiocy of allowing a housing development next to the site boundary. The minimal description of proposals is given by ERM, as it was at the public exhibition some months later. The levelling of sediments is described, though the metallic obstructions identified are not further described- except to say that these unquantified risks would just be further dumped into deeper areas to then be covered up with regurgitated sediment from elsewhere. The proposed discharge route to the canal was cited as being along the Western embankment, though as it transpired this did not in fact take place. NB THE LETHAL ADULT HUMAN DOSE BEING 50-100mg/kg BY WAY OF COMPARISON, WHICH LOOKS LIKE THIS. There is no explanation made as to why the smaller lagoon will not be capped, or why any of it has to be moved at all if it poses such a low risk. MONITORING- NOISE, ODOURS AND PHOSPHINE GAS were proposed to be monitored. We get a timescale of the proposed – dredging accounts for 30% (51 days) of the total days of site works. This therefore proposed that the works would total 170 days. The sediment is described as “fine grain” implying that when wildfowl ingest the material, which is purportedly the purpose of this deceitful exercise, then they would quickly be poisoned by any p4 small particles within the material. Calcium phosphate and p4 would be impossible to distinguish except under a microscope. We get a first mention of the flocculant used in the sediment works, which ERM would not name when directly asked by us later. 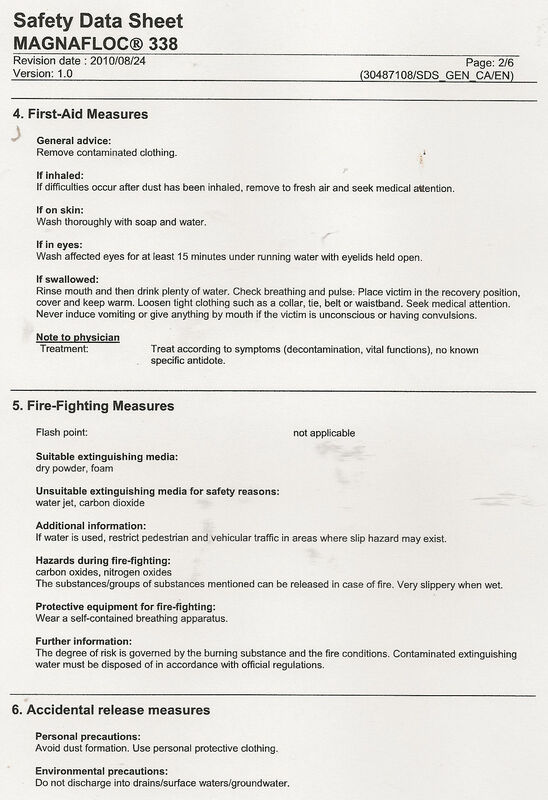 THIS IS MAGNAFLOC 338– a partial data sheet is provided in the appendix of the report, though pages 2, 4 6 are oddly missing from the EA supplied document. ERM obviously used the internet data sheet shown below. 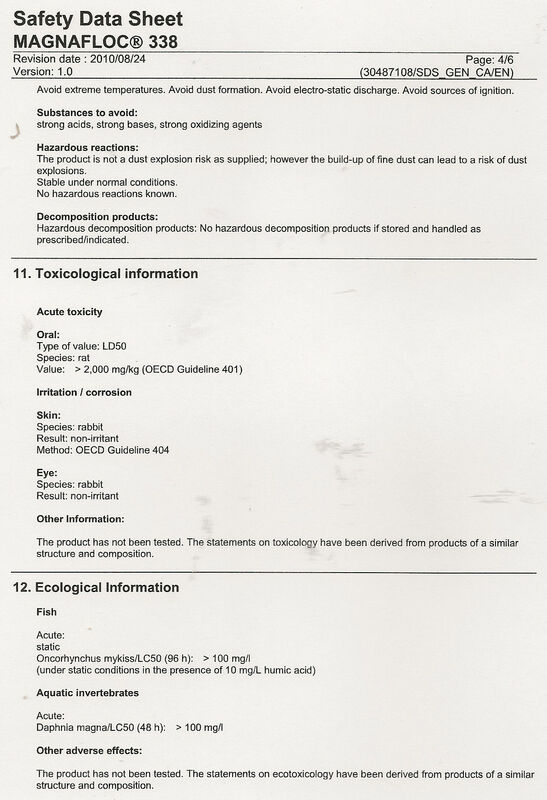 We have found other safety data sheets for this chemical formerly known as Alcomer 80 which appears to show some toxicity to daphnia. It is also recommended to avoid using this chemical with strong acids and bases. 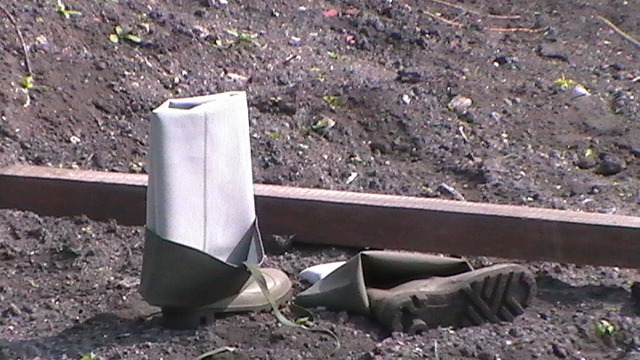 How this relates to the strong fluorosillicic acid reported at the site is unclear. Crucially there appears little evidence of it being used in white phosphorus contaminated environments and sediment. A list of operation and maintenance manual criteria are described to be implemented after the works have taken place, with an annual site walkover and sonar scanning of the sand capping layer. The key buried point in this is “protocol in liaison regarding any changes in use of the lagoon or access”. This is a fairly strangely worded statement. A change of use in planning terms would require a planning permission to be advertised. 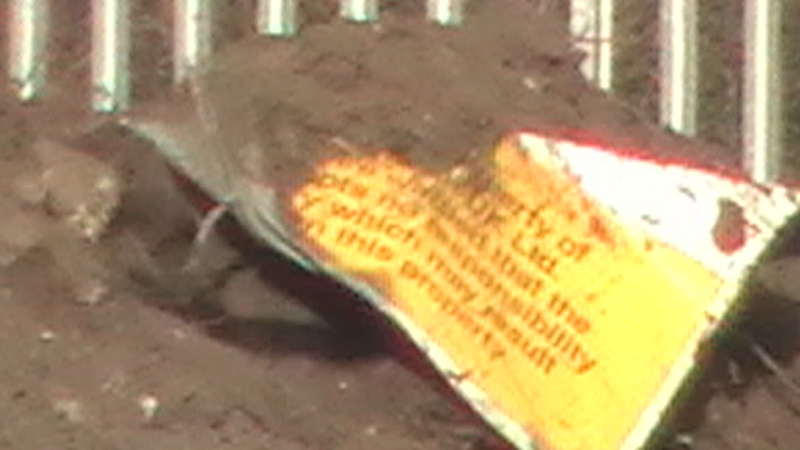 As the site is a hazardous waste site, and it remains so after the works have taken place, one can only speculate that Rhodia are fully prepared to dispose of this millstone at a convenient opportunity when they think that everyone will have forgotten what they buried there- “an historical landfill site” is just the start of this corporate deception. A suite of groundwater monitoring for specific chemicals is described on page 12, which is an improvement on the previous limited set of criteria, though the limited set of surface water samples is not anywhere near appropriate given the disturbance of material in the sediment. URS- Rhodia’s other consultants actually went on to blame increases in specific chemicals in the lagoon to be as a result of the dredging works, which implied that the flocculant was not performing as well as was anticipated by ERM. 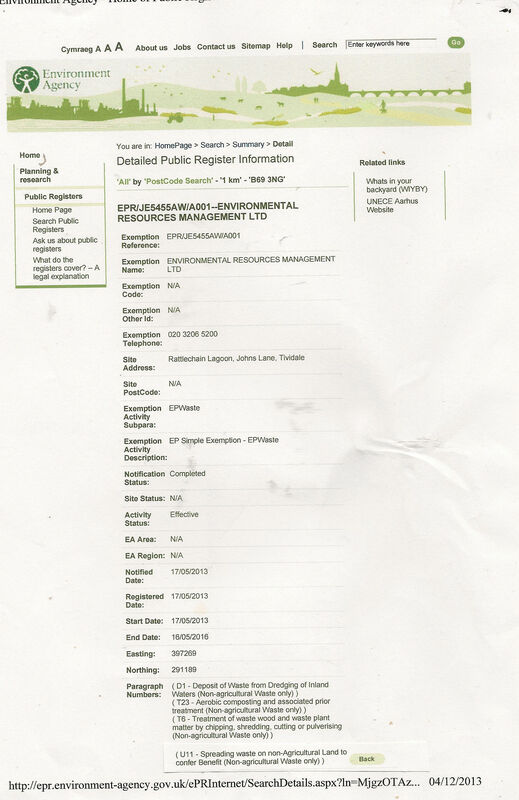 Monitoring well BH5 which was later found to have been abandoned, 7 years previous is not stated as so in this report. There is therefore no mention of having to install a new monitoring well in these works, as later transpired. Various pretty diagrams of the lagoon are provided. “The former brick claypit materials” are not quantified in these diagrams, nor what most likely lies beneath them. We summarise observations that were made during the 10 months when activity took place at the lagoon. See also blog posts that were made during this time. “Solvaytion” was not here! The works were supposed to start on 28th January but there was no sign of any contractors on site during the month. The weather turned frosty as nature appeared to be offering its own “barrier” between the birds and the toxic waste underneath the lagoon surface. Belgian contractors Heyrman De Roeck were noted to mobilise and commence work at the site week commencing 20th February 2013 after the snow was starting to melt. 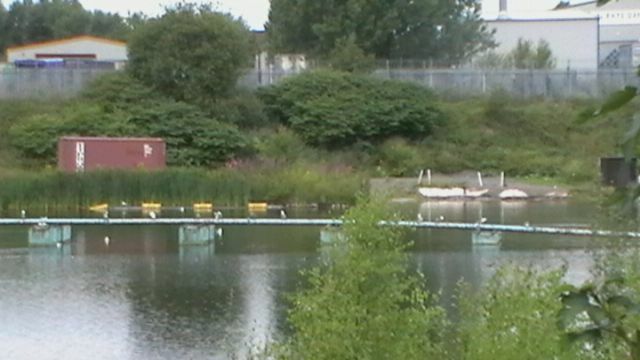 Excavation of the south side of the site nearest to the new housing estate on the former Tividale sewage works announced the visual changes that would begin to the lagoon. 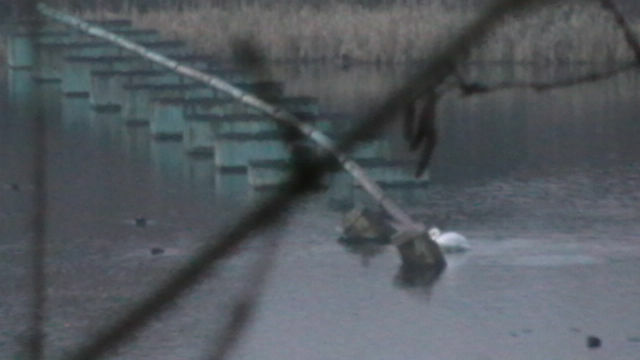 During this period a pair of swans arrived at the lagoon. We contacted the RSPCA to try to remove them, and this was arranged with Rhodia as the works were taking place. Unfortunately Rhodia tried to turn this into a PR exercise in a subsequent newsletter- though in reality they had not applied for a licence to remove the swans from Natural England as they had told the RSPCA that they had. Visual changes began to emerge as the contractors removed the pipe in “the beach area” and began disturbing contaminated material in this area shovelling it into the water. During this time, we recorded evidence of p4 being released to air by visible plumes of phosphorus pentoxide. 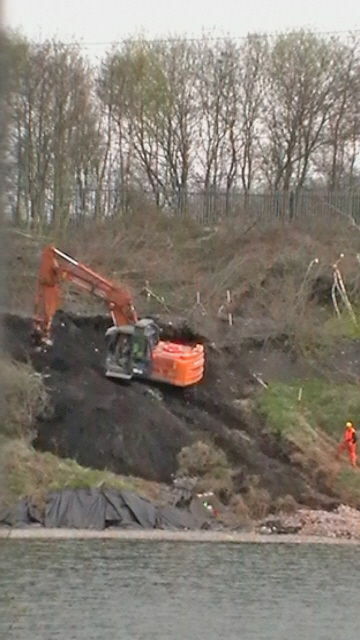 The work around the reed bed areas proceeded along with the excavation of the North embankment. “The valley area” that had been the location of the canal discharge pipe was also exposed to reveal part of this old discharge pipe. It became clear that this work was not proposed in the draft ERM proposals. A spud barge began to transport the mechanical diggers around parts of the lagoon, removing more barrels and debris along the eastern side. The most iconic moment of the entire works and one of Rhodia’s main ambitions to try to disguise the former dumping use of the pool occurred at the end of the month. The long super gun type pump that had discharged waste into the pool was removed. At the conclusion of the month, the icy weather had returned and into the picture came Dutch contractors Klaar, whom ERM/Rhodia had kept under close raps- most likely concerned with trying to disguise their lack of experience in remediating white phosphorus contaminated lagoons. They did however have some experience of laying geotextile membranes in other locations, and also have the ability to remove contaminated sediment off site altogether. As stated above- Rhodia/ Solvay did not want this because it would have cost them. The construction of the main dredger began. The word of the month was FLOCCULATION. 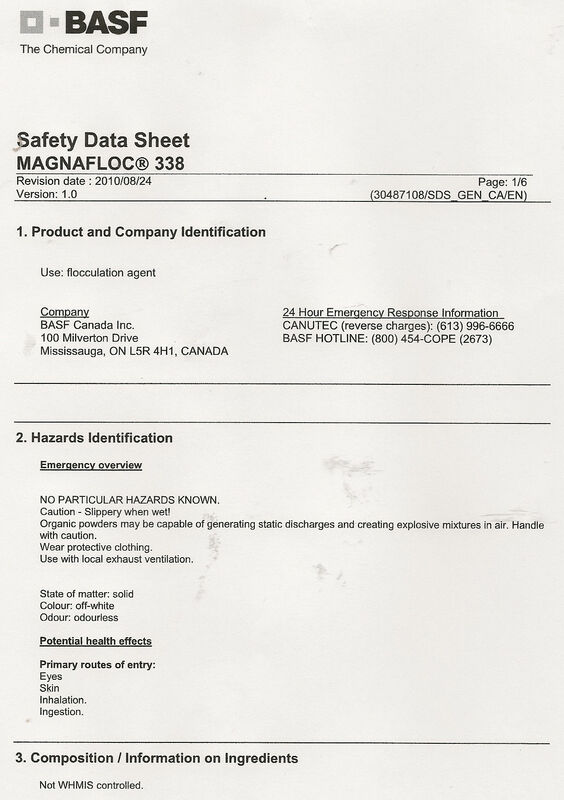 We now know the mystery flocculant, Magnafloc 338 was used by the contractors. 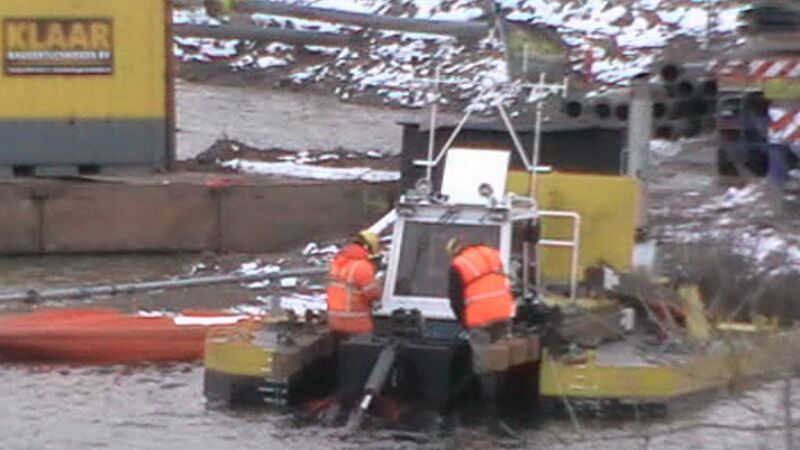 The cutting dredger was connected to a long snaking pipeline that allegedly dispensed the hoovered sediment into harmless firmer piles. 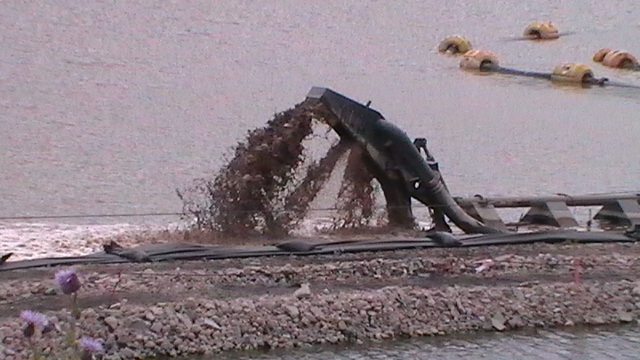 We also recorded how the causeway path was spectacularly breached to allow this dredger between the two lagoons and the phosphorus contaminated sediment that was ejected. During this period, work began to intensify to include weekends– partly as a result of being behind schedule due to the unforeseen wintery weather. We have yet to see any clear evidence presented that the contaminated sediment from the smaller lagoon was transferred into the larger lagoon. 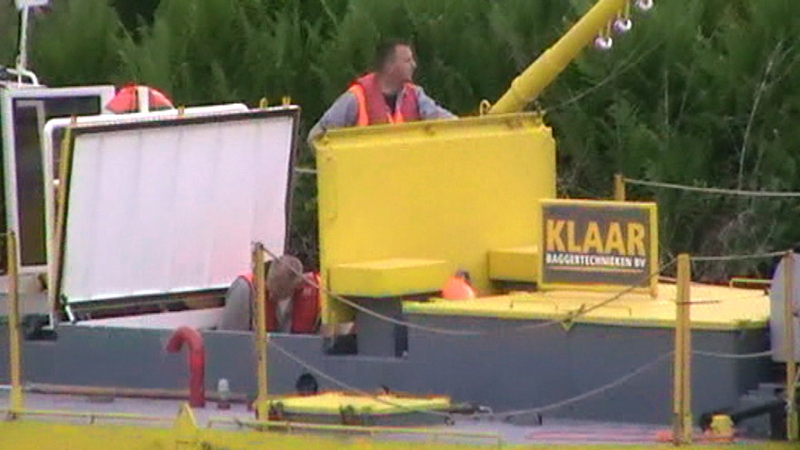 The main issue with the dredging operations appeared to be the unforeseen amount of algal blooms underneath the water. This unnatural growth was mainly caused by the increased nutrients of phosphate in the water, which historically made the lagoon look like a carpet of green on the surface during hot summers. The causeway path was widened with looser and bulkier crushed stone material. 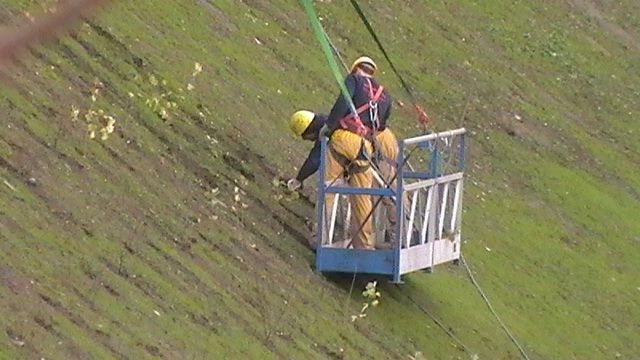 Whilst this continued the algal problems became a major issue for work continuing at the site. We observed a pit being dug at the Eastern side of the lagoon near to the houses, with the tipping of muddy vegetative material dredged. We are now aware that ERM applied for special permission to the environment agency to allow this-in the form of a waste exemption EPR/JE5455AW/A001 which was not planned in the original improvement works. We print this below for clarification from the EA’s public register. This waste exemption certificate requires some explanation. A glossary of terms mentioned in the paragraph numbers can be read below. “What is the purpose of this exemption? 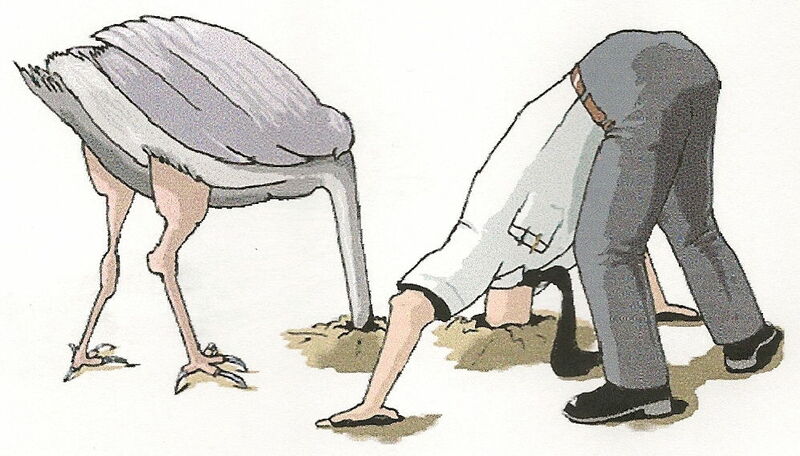 We do not see how it is possible for ERM to have ensured that there was no white phosphorus or “hazardous waste” contained within the material that they dredged based on the fact that the dredgings arose from “a hazardous waste site.”! Are we missing something here or did the environment agency at this point not really care? The guidance they offer is typically poor and the permit holder, not they have the sole policing role. “What waste can be deposited under this exemption? 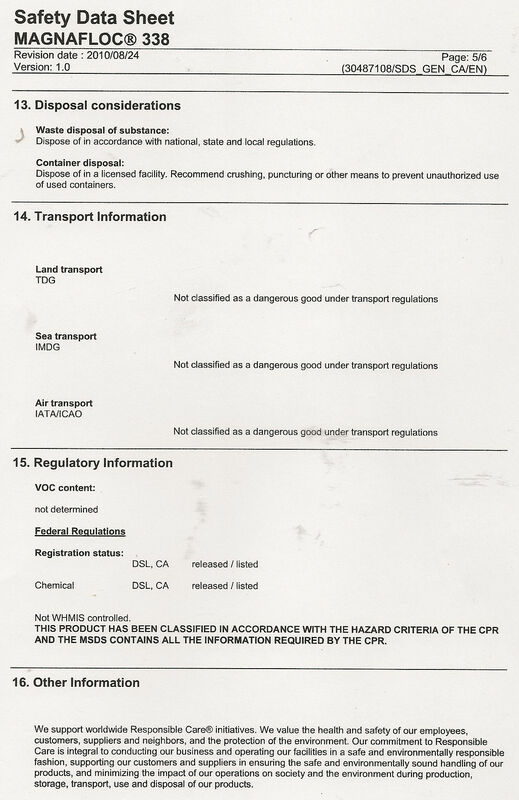 The wastes codes below are those listed in the List of Wastes (LoW) Regulations. You should read the guidance on the LoW to ensure that the waste type you want to treat fits within the waste code. You need to make sure your waste falls within the LoW code and the written description in the table. WE THEREFORE CONTEST THAT THE MATERIAL DREDGED TO LAND AT THIS POINT DID NOT MEET THE EA CRITERIA- WAS EVERY SINGLE DREDGED PIECE OF MATERIAL TESTED BY ERM DURING THIS PROCESS? “aerobic composting” means the autothermic and thermophilic biological decomposition and stabilisation of biodegradable waste under controlled conditions that are aerobic. T6-TREATMENT OF WASTE WOOD AND WASTE PLANT MATTER BY CHIPPING, SHREDDING, CUTTING OR PULVERISING. 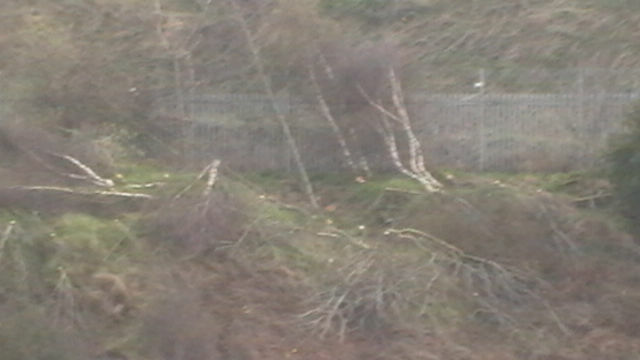 As spring bloomed, rattlechain’s north embankment was chopped down in another scheme that had not been proposed in the ERM improvement plan. In reality this confirmed that they were progressing a closure plan scenario for Rhodia/Solvay and not the “bird protection” cover story. It also allowed the permitted T6 segment mentioned above. By the end of the month, a temporary pipe constructed out of a piece of the old pipe pontoon was discharging water out of the site, that had just had highly toxic material stirred up that would have been present in the water in both lagoons. May started with more demolition of the steep embankments around the lagoon. It was during this phase that an old Albright and Wilson sign came to light, reminding that this hazardous waste lagoon was once managed by a company that claimed little risk associated with the site and how “efficient” it was as a model site. There were new horizons opening up, as well as polluted waters. The scrap pieces of lagoon pontoon were also scrubbed as work continued to improve only the appearance of the old to the new residents looking in from their houses. But the hazardous waste still lay beneath their upstairs window views. 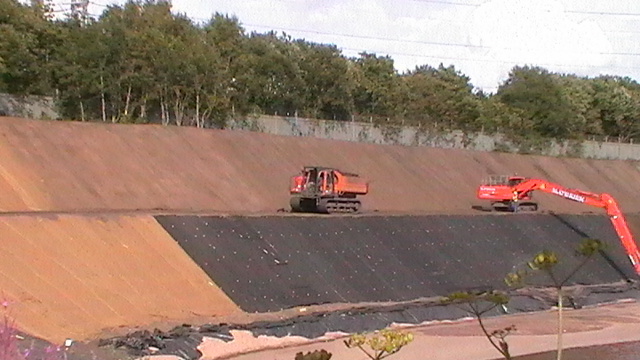 The fourth month saw more sculpting of the North embankment in preparation for the laying of the geotextile membrane. It also saw the removal of more weed from the smaller lagoon. The large cutting dredger also was lowered onto this side to carry out weeding duty with mixed success. 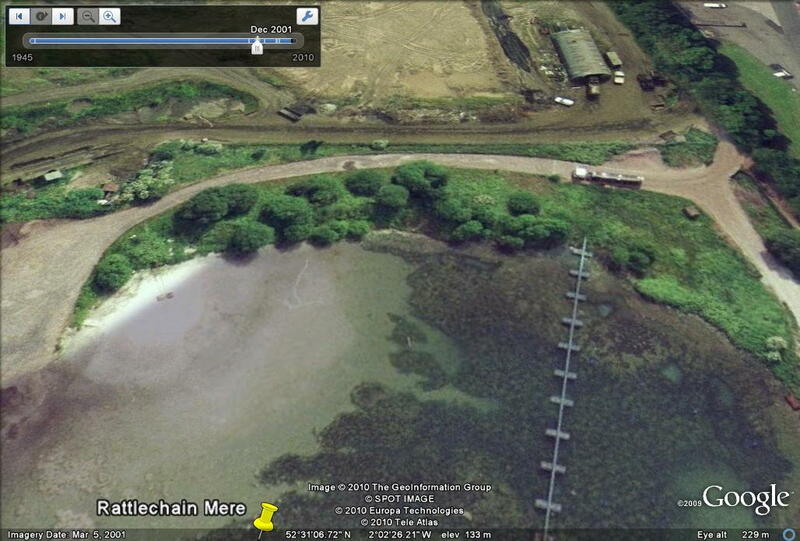 It was also alleged that at this point the sediment from this lagoon was transported to the main lagoon- though we have no evidence of this and none has been presented by Solvay or their contractors to prove that there is no p4 sediment left in this lagoon. We discussed what had gone before and what may be still to come in this blogpost as some of the dredging equipment was packed away. The “lost” borehole BH5 on the Mintworth mound side of the site was also re-established as BH5A. We issued some advice to the suffering resident as the picture story side of the works came into focus with the laying of the geotextile. This was unfolded and stitched together and then thousands of tonnes of sand began to be imported in lorries to weigh it down. 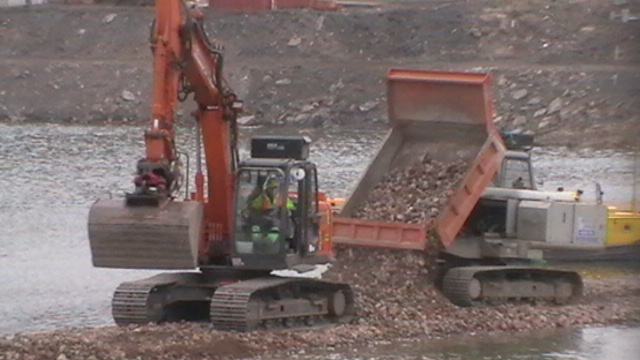 The geotextile was “sunk” using a mix of sandbags and stones. 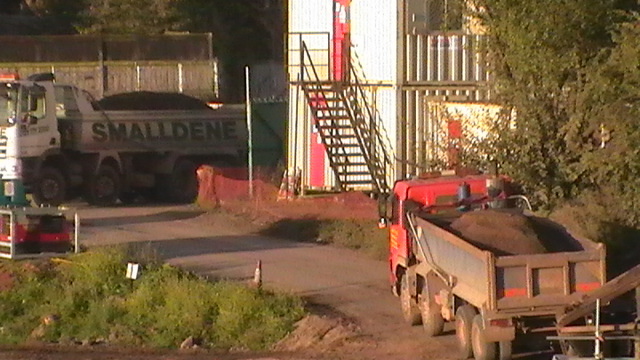 At this point the lorry loads of sand began to arrive at an estimated 40 per day from various different contractors. 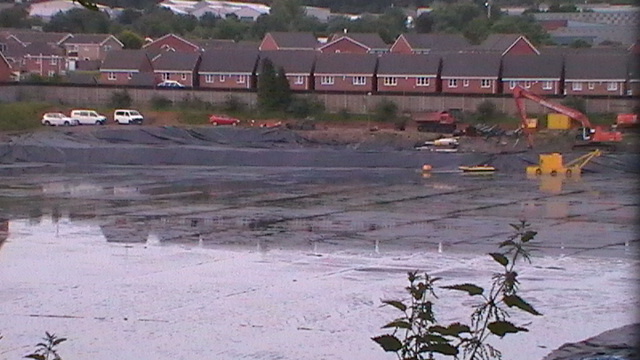 This month saw the spraying of sand across the top of the water level to fully sink the geotextile. 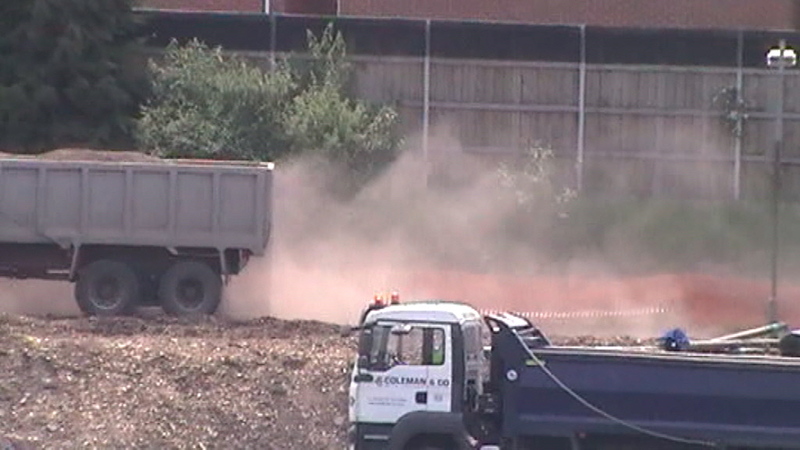 We recorded the unacceptable dust being generated at the site during this time. We noted birdlife at the site as the sand spraying continued into week 20. This was fed into the converted cutting dredger which in turn moved around the lagoon in an attempt to level the surface, and of cause to try to bury the problem for Solvay. We also noted a variety of visitors at the site over the month and then a planned two week work hiatus. We made a few observations during the two week lull in operations. Klaar and Heyrman De Roeck returned to the site and continued the sand spreading operation as lorry loads of sand continued to arrive. Large piles of sand built up around the Southern side of the lagoon near the houses. Cracks in the North embankment were covered up using more top soil. Then later a macro mat material arrived , rolled out and then staked to further cover over the surface, though under the guise of “stabilisation”. This continued into late August. During the start of Autumn we reflected on some of the previous parts of the work and had a rattlechain “mash-up”. By week 30, the watercraft were being packed away as the main works at the waterside were wound up. Numerouus different road hauler contractors were noted to be delivering sand. We made a number of observations as the works continued into fall. Some geese returned to the site utilising the now grass seeded smoother embankments. A new pier began to be constructed near to the North embankment. This was not in the original ERM improvement work plans. As became apparent this was to provide a new pumping arrangement to the Birmingham canal- though as yet there appears to have been little use of it to do this. Water appeared to be being pumped from the smaller lagoon into the now “capped” larger lagoon. 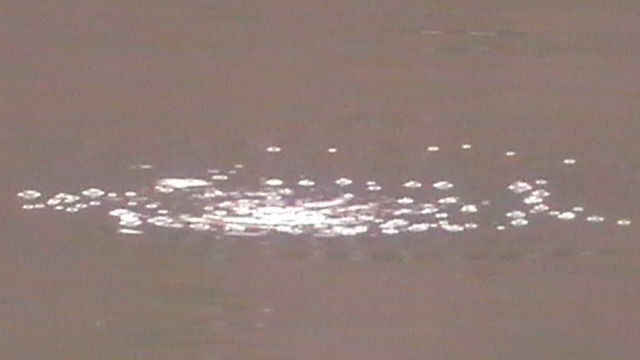 We also directly observed evidence of what we believe to be phosphine gas being evolved from this now capped main lagoon which we recorded on video. Very ominous signs. 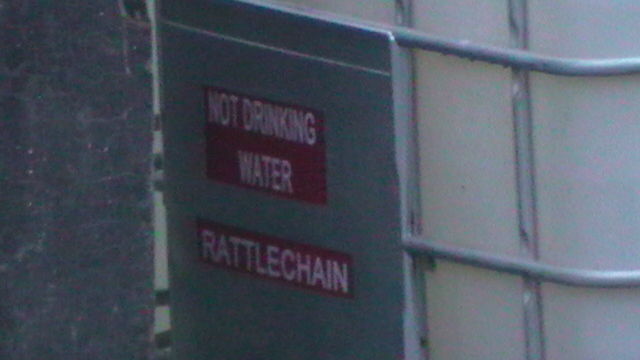 We did it OUR WAY to bring the story of rattlechain to public attention, where a chemical company and their PR had tried to spin their way out of trouble. By the end of the month the main works had finished with the Heyrman De Roeck vehicles loaded up on their way back to the continent. Despite seeming to be the end of the work, on which we reminisced, there was some unfinished business in the form of tree planting around the battle scarred North Embankment. It was also a time when the discharge to the canal appeared to start again, though this turned out to be a short lived exercise. 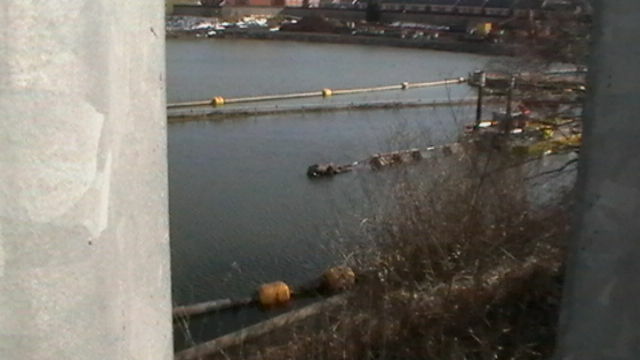 Testing by ERM and Rhodia operatives now appeared to extend to the canal as well as the lagoon. The demobilisation from the site saw the removal of the portacabins that had been at the site for several months. We though t apt that the toilets appeared to be the last out of the site, but the chain had not been pulled at the dump itself which retained all of the solids. All in all Eleven months of toxic deception. But it wasn’t over yet!!! The environment agency made a rare appearance. This was December when the works had supposedly ended. But they hadn’t. In February-a full year after they had started, Heyrman De Roeck were back on site dumping aluminium sulphate into the smaller lagoon. The consequence of the work they had toiled over appears to be one toxic mess covered up underneath and now a new one over the top. 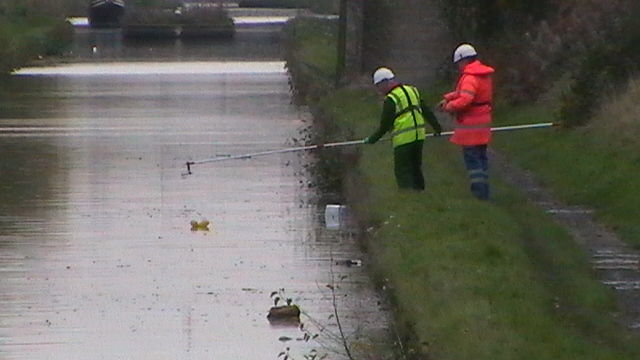 There has been no discharge to the Birmingham canal for many months. 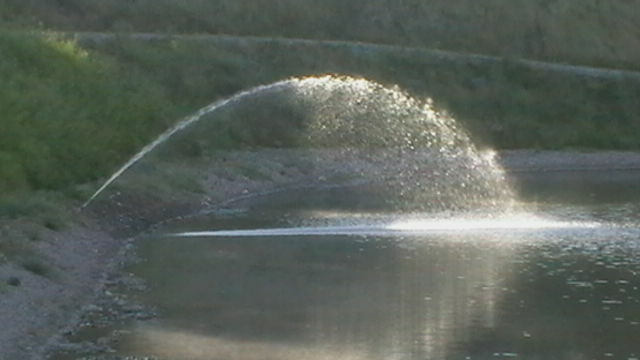 Instead a hose from the contaminated uncapped smaller lagoon pours water into the capped larger lagoon- an exercise in circulating water to remove the consequences of a toxic cover up. The gas being given off at the lagoon remains visible.